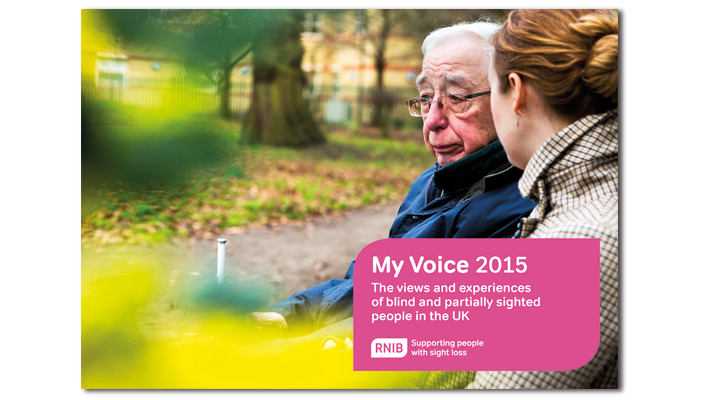 The realities of the lives of blind and partially sighted people in the UK are set out in RNIB’s latest report, My Voice 2015. The report is based on one of the largest ever studies of its kind, with over 1,200 registered blind and partially sighted people taking part. My Voice 2015 reports on their experiences of education, employment, health and wellbeing as well as transport and technology and looks at support and the attitudes of the public. This latest research shows that life can be extremely tough for many people living with sight loss and is food for thought for professionals preparing young people with vision impairment for adult life. It is however encouraging to note that young people were much more likely to receive training and support with tasks like mobility and preparing food than the older people surveyed. The report also highlights a generational divide in the use of technology among blind and partially sighted people. For example 86 per cent of blind and partially sighted 18-28 year olds say they make the most of new technology. In contrast, the figure for people of all ages who feel able to use new technology was less than one in three. The majority who are not tech savvy say they’d like to learn more if obstacles were removed. To read more about the challenges of living with sight loss visit the My Voice page and read the full report.